Manila, Philippines - Typhoon Glenda (international name: Rammasun) has passed with its intense gusts of winds pummeled Bicol region, Quezon Province, rest of Southern Tagalog and Metro Manila. Several trees were uprooted and unstable structures were damaged. As of 3 p.m. on Wednesday (July 16, 2014), the typhoon's eye was over Olongapo City with maximum sustained winds of 140 kph and gustiness of up 170 kph. It is moving Northwestward with a speed of 25 kph. The National Disaster Risk Reduction and Management Council (NDRRMC) reported that at least five persons were killed with a total of 93,855 families or 450,689 persons were affected in regions IV-A, IV-B, V, and VIII. A total of 76,598 families or 373,177 persons were evacuated in various areas in Regions IV. Around 86% of Meralco’s franchise area is experiencing power outage brought about by downed poles, lines and outages of NGCP’s transmission lines due to Typhoon Glenda. "Meralco crews are working round the clock to conduct damage assessment and clearing operations to ensure safety during actual restoration. ", Meralco said. Meanwhile, State of Calamity was declared over Gumaca, Quezon, Albay, Camarines Norte, Camarines Sur, Cavite and Muntinlupa City due to large scale of damage. 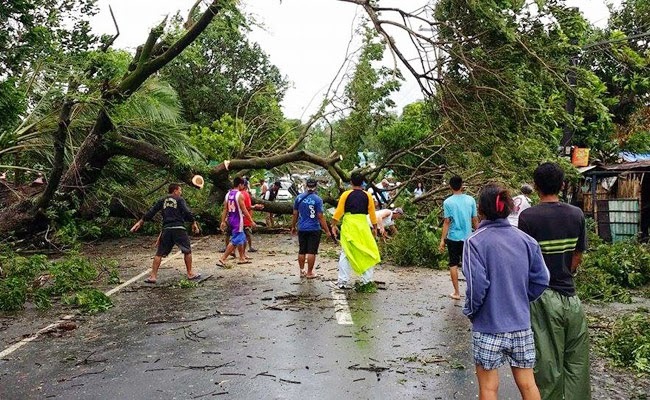 On Wednesday afternoon, Presidential Spokesperson Edwin Lacierda released statement, it says: "We ask the public to continue monitoring media and online resources to keep updated on the weather and advisories concerning cleanup and restoring services. The President is monitoring the situation as the NDRRMC, DPWH, MMDA, DSWD, with the PNP and AFP, attend to evacuees, the surveying of vital infrastructure, and the clearing of roads. We appreciate the cooperation and assistance of the public in these tasks." TheSummitExpress posted here photos and videos courtesy of ABS-CBN News to show the extent of damage caused by the typhoon.